Dartmouth engineering professor Jifeng Liu has received an award from the Faculty Early Career Development (CAREER) Program at the National Science Foundation (NSF). The CAREER Award is NSF's most prestigious award for young faculty who "exemplify the role of teacher-scholars through outstanding research, excellent education and the integration of education and research." The award will support Professor Liu's research on "Low-Temperature Growth of High Crystallinity GeSn on Amorphous Materials for Advanced Optoelectronics" which investigates new technology for cost-effective, high-efficiency tandem solar cells as well as three-dimensional photonic circuits on future generations of silicon microchips. "This project not only presents unique opportunites for both graduate and undergraduate education, but will also offer hands-on laboratory experiences for 10th and 11th grade students," says Liu who also plans to share educational activities with the general public via YouTube and other public media. 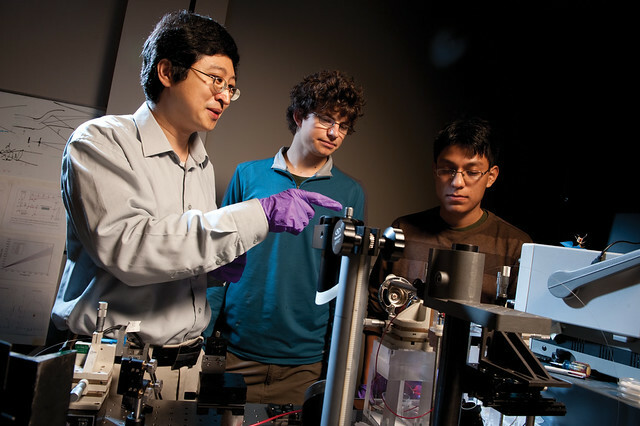 Professor Jifeng Liu with students. I want to apply science to our everyday life, explore the world, and understand the rules of nature. Engineers experiment with these rules to benefit humankind. It’s just like playing chess, but you don’t know the rules at the beginning. Scientists try to find out the rules, but it’s engineers who apply the rules and become good players for the benefit of everyone. There are two aspects and goals in my research: One is to produce renewable energy, and the other is to try to reduce the energy consumption of information technology. We hope that with our research we can produce solar cells that are less expensive and more efficient so that they can be deployed widely in the world to offset the consumption of fossil fuels. Few people realize how much energy is consumed in the information industry since the invention of computers and the Internet. The Internet is one of the fastest growing technologies in the information age. The data flow on the Internet is growing by 40 percent per year, which basically doubles every two years. I’m trying to apply photonic technology to information technology to reduce the overall energy consumption. This would make information technology more sustainable, what some people refer to as green IT. Teaching is not just about giving information to students; it’s actually a great motivation to do some rethinking. A smart student can ask you very interesting questions, so you better be prepared for those and really start to look into all aspects of your own learning. Sometimes we can get some new ideas from such thinking. My personal style is to help students think about themselves as explorers and innovators. We engineers want more people to understand the importance of engineering and science to society. The more people we educate, the more we influence the world.